Retirement should be like a second childhood. 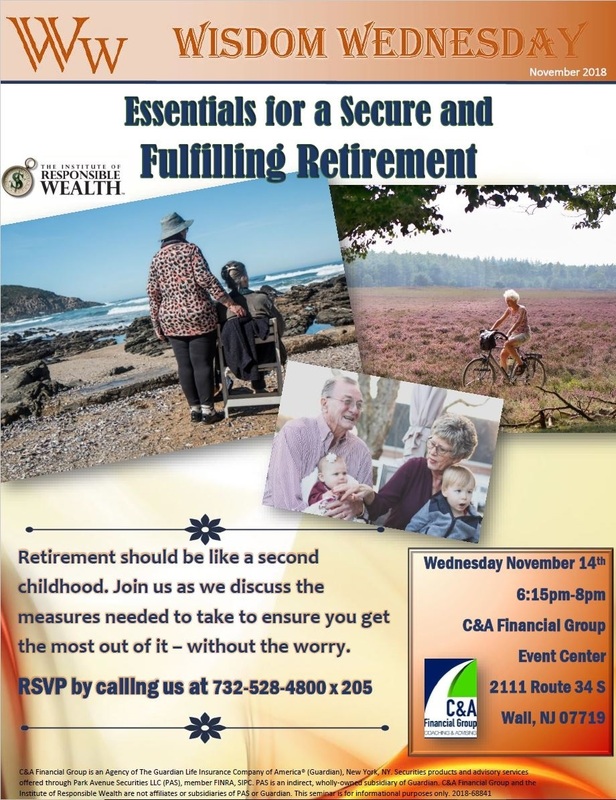 Join us as we discuss the measures needed to take to ensure you get the most out of it – without the worry. Click here for the full October 2018 newsletter! Click here for the full September 2018 newsletter! Click here for our September 2018 Coaching Call! This month Frank Congilose and David Suckey have a discussion about life insurance, its benefits, and the different types of insurance available. C&A Financial Group is an Agency of The Guardian Life Insurance Company of America® (Guardian), New York, NY. Securities products and advisory services offered through Park Avenue Securities LLC (PAS), member FINRA, SIPC. OSJ: 2111 Route 34 South, Wall, NJ 07719, (732) 528-4800. PAS is an indirect, wholly-owned subsidiary of Guardian. C&A Financial Group and the Institute of Reponsible Wealth are not affiliates or subsidiaries of PAS or Guardian.